Judah Lakin, M.Ed., is a bilingual and content ESL social studies teacher at Hope High School in Providence, RI. He received his B.A. in history from Brown University and his M.Ed. in teaching English as a second language from Rhode Island College. Lakin also cocoordinates the after-school tutoring program and the family-engagement committee. He has dedicated his efforts to helping undocumented immigrants gain access to higher education. He founded Higher Inc., a nonprofit aimed at giving scholarships to undocumented students who need financial assistance to attend college. Lakin has traveled extensively, including to the Dominican Republic, Ghana, and Guatemala to visit and learn from the families and communities he teaches here in the United States. Erin Leininger is the Middle School Curriculum Coordinator at International School–Manila in the Philippines. She has taught diverse groups of adolescent English learners in various national and international contexts including California, Rhode Island, Kuwait, China, and the Philippines. 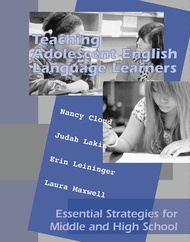 Leininger uses her experience of teaching academic English language development and co-teaching with content teachers to develop, teach, and advocate for curriculum that is conceptually rigorous, language rich, and developmentally equitable for all learners. Laura Maxwell, M.A.T., is an English teacher at Hope High School in Providence, RI, and a writing fellow through the Rhode Island Writing Project. Since 1997, she has taught in urban schools in Providence and in Cape Town, South Africa. Before becoming a teacher, Maxwell worked in the nonprofit sector for the Coalition of Essential Schools and the Education Commission of the States. She received her M.A. in teaching English from Brown University.